To comfort his Master's heart. I am including a poem that was written about sixty years ago by Mina Brown from St. John's on the death of her beloved Newfoundland, Larry, which was bred by the late Hon. Harold Macpherson of Westerland Kennels in St. John's, Newfoundland. A place reserved for dogs that fall asleep? Sparks are such nasty things to have about. For one young Newfoundland that died today. And rest his soft, black chin upon my knee. We met Thee walking on the moonlit hill. Thy soothing voice, and then a friendly bark. They smiles hypocrisy, they words deceit! Pass on--it honours none you wish to mourn. I never knew but one--and there he lies. A DISPATCH link with Canada might be forged to mark the bi-centenary of the birth of the poet Lord Byron's much-loved Newfoundland dog, Boatswain. It all began last month when chief reporter Denis Robinson gave a talk to Hucknall Parish Church's Mothers Union branch. During his address, he recited three poems he had written � and one was about Boatswain. At that time, he had no idea of the dog's bi-centenary. But a branch member asked if he could provide her with a copy and a similar request later came from Mavis Ellis, of Papplewick. Mavis has learned that the bi-centenary is a big event for people of Newfoundland, Canada. After all, Boatswain has played a big part in putting the province on the world map. As a result, Mavis has sent a copy of Denis's poem to the Mayor of Newfoundland's capital, St John, and asked if it can be circulated to junior schools in the province. Other copies have been forwarded to Byron's ancestral home, Newstead Abbey. Boatswain's imposing tomb, complete with the poet's famous epitaph, is located in the abbey grounds. One copy has been placed next to the well-known portrait of Boatswain by Clifton Tomson and others will be given to children who visit the abbey. Byron built this noble tomb. That at least is what men say. One on whom he could depend. He deserved all my devotion. Animals can all walk tall. Each poor beast has been extolled. That I had been by his side. Still a sleeping dog I lie. Says: "Mum, there's a DOG in there!" Place your trust in me--it's crucial to my well-being. Don't be angry at me for long and don't lock me up as punishment. You have your work, your entertainment and your friend. I have only you. Before you scold me for being uncooperative, obstinate or lazy, ask yourself if something might be bothering me. Perhaps I'm not getting the right food or I've been out in the sun too long, or my heart is getting old and weak. Take care of me when I get old; you too, will grow old. Go with me on difficult journeys. Never say, "I can't bear to watch it," or, "Let it happen in my absence." Everything is easier for me if you are there. Remember, I love you. Straight to the Lord above. That hide under the table on "nail day"
That forget the word "stay"
We pray for dogs that run in play and those that run because of fright, for those that obey out of love and those that try to oblige until they break, for those we never give up on and for those that don't get a second chance. Embrace these little and not so little ones. Guard them, protect them, and grant them a peace that only we as humans can deny them. Forgive mankind's abuse to these that were meant to be a most precious and special gift. From a poem called, "The Big Fellow"
I once read a quote by James Thurber that I wish I had written down, 'twas something about dogs would be in heaven for sure, but man was less definite. a hard working mind put to rest. "Grieve not, nor speak of me with tears but laugh and talk of me as if I were beside you.. I loved you so--- 'twas Heaven here with you." special, someone who was left behind. Somewhere on the other side of the Rainbow Bridge there is a huge, peaceful lake. There are trout and other fish swimming in that lake. The beaches surrounding it are covered with small, round pebbles. Cliffs climb into a dense forest of fir trees. A stream ripples over rock leading towards the ocean, and there are ferns, berries, and wild flowers growing along the edges of it. This is for the water dogs we've lost too soon, because there's never a good time to lose one of these treasures....Calypso, Bear, Ophie, Shad, Whitney, Teddy, and all the others we've known and loved so well. I stop. I know I'm not to cross. But why, I want to know. Then you will find--it's your own affair-- But...you've given your heart for a dog to tear. Contributed by: M. Ashley McLure	"Man's inhumanity to man is only surpassed by his cruelty to animals." When dogs go to Heaven, they don't need wings because God knows that dogs love running best. He gives them fields. Fields and fields and fields. When a dog first arrives in Heaven, he just runs. Dog Heaven has clear, wide lakes filled with geese who honk and flap and tease. The dogs love this. They run beside the water and bark and bark and God watches them from behind a tree and smiles. There are children, of course. Angel children. God knows that dogs love children more than anything else in the world, so He fills Heaven with plenty of them. There are children on bikes and children on sleds. There are children throwing red rubber balls and children pulling kites through the clouds. The dogs are there, and the children love them dearly. And, oh, the dog biscuits. Biscuits and biscuits as far as the eye can see. God has a sense of humor, so He makes His biscuits in funny shapes for His dogs. There are kitty-cat biscuits and squirrel biscuits. Ice-cream biscuits and ham-sandwich biscuits. Every angel who passes by has a biscuit for a dog. And, of course, all God's dogs sit when the angels say "sit." Every dog becomes a good dog in Dog Heaven. God turns clouds inside out to make fluffy beds for the dogs in Dog Heaven, and when they are tired of running and barking and eating ham-sandwich biscuits, the dogs each find a cloud bed for sleeping. They turn around and around in the cloud until it feels just right, and then they curl up and they sleep. God watches over each one of them and there are no bad dreams. Dogs in Dog Heaven have almost always belonged to somebody on Earth and, of course, the dogs remember this. Heaven is full of memories. So sometimes an angel will walk a dog back to Earth for a little visit and quietly, invisibly, the dog will sniff about his old backyard, will investigate the cat next door, will follow the child to school, will sit on the front porch and wait for the mail. When he is satisfied that all is well, the dog will return to Heaven with the angel. It is where dogs belong, near God who made them. The dogs in Dog Heaven who had no real homes on Earth are given one in Heaven. The homes have yards and porches and there are couches to lie on and tables to sit under while angels eat their dinners. There are special bowls with the dogs' names on them. And each dog is petted and reminded how good he is, all day long. Dogs in Dog Heaven may stay as long as they like and this can mean forever. They will be there when old friends show up. They will be there at the door. to be true friends to animals and so to so to share the blessings of the merciful. asked what kind of game this was. The second child replied, "I'm saving starfish." The second child scooped another starfish up from the sand, considered it briefly, then hurled it into the ocean. "It mattered to that one." 'til at last, she fades on the horizon. and just at the moment when someone at my side says, "She is gone,"
"There she comes!" and that is DYING. I am me and you are you, whatever we were to each other we are that still. Let my name be ever a household word that it always was. I am but waiting for you, for an interval somewhere, very near, just around the corner. The trees were blowing in the gentle breeze. The sun was shining thru the leaves on the trees. Off in the distance you can see a waterfall. The water flows gently as a rabbit sneaks a peek. The birds soar high as they fly by. Chasing each other and just having a ball. They play all day from morning to night. There's no more rain, just warm sunlight. Off in the distance the trumpets would blow. All would look up and notice a bright glow. As another pet has come home, who had earned his wings. to reach down from above. for arrows in her eye. And so, by God, was I. Rose up with piping cry. I thought to see her fly. And so, at times, could I. Treat me kindly my beloved friend, for no heart in all the world is more grateful for kindness than the loving heart of me. Speak to me often, for your voice is world's sweetest music, as you must know by the fierce wagging of my tail when the sound of your footstep falls upon my waiting ear. Feed me clean food so that I may stay well, to romp and play and do your bidding; to walk by your side, and stand ready, willing and able to protect you with my life, should your life be in danger. And, my beloved friend, when I am very old, and I no longer enjoy good health, hearing, and sight, do not make heroic efforts to keep me going. I am not having any fun. Please see that my trusting life is taken gently. I shall leave this earth knowing with the last breath I draw that my fate was always safest in your hands. But I do not want to wander beyond this place. I just need to rest awhile for my friend I wait. Please let them know I love them still. What they did, they did with love. To my Creator's Heaven above. Now I ask that I may wait. I will lay quietly here by the gate. It wouldn't be Heaven at all. They will not go quietly, the Newfs who've shared our lives. Our feet still go around the place the food dish used to be. That one place in our hearts belongs to them...and always will. A star punched a hole in the heavens tonight. We're taught only humans have souls. My heart bursts with the sadness of separation. Sadness and joy flow in and around my heart and soul. God decides in the creation of souls. I felt his heart when we met. I saw his soul when he died. A star in the heavens, light upon light, cries for me. 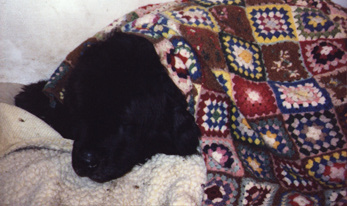 (c) Carmella Lorano, 1994 in honor of her dog, Harry. "You were with me to the very end and even after I had gone" you held me, and as my soul left my body and I looked down and saw you crying, I wanted so much to tell you that I understood. You did this for me. "I tried to tell you in my own way that it was time for me to leave, and I thank you for understanding. No other will take my place, but those I left behind will need your love and affection as I have had. "You still think of me, and there are times when you try to hide your tear-filled eyes...but please, be happy and think not of sadness, but of how I made you happy and made you laugh at the funny and smart things that I did. "There are no fences here, for no one has the desire to 'dig out'. "There are no thunderstorms here, therefore no fear is ever present. "There are no fights here. Everyone is congenial. "There is no hunger. There is no thirst. There is much to explore. "Many of us who are older take care of the little ones and guide them. It's fun watching them run with their ears flopping and their curly tails wagging. "We have four seasons here...and most of us agree that winter is our favorite. "When it is time for my friends to leave, I will meet them at the Gates, and I will acquaint them with the beautiful and serene place, and I will take care of them for you. "Thank you for loving me, caring for me, and having the courage to let me go with dignity." Their size is small in comparison to the amount of love they share. No matter how much hair they shed there is always plenty left in which to bury your face. And the drool...well, always have that towel handy! Don't they know, though, that it gets no better than this? Those eyes..their hearts..so big and ever giving you love. Their faces speak to you of kindness, of joie de vivre, of a knowledge that they have it all figured out; life is for love and laughter, for being there to comfort and caress. They protect and wrap themselves around you and enter the very core of your being. They make you smile when you thought there was nothing left to smile about. They fill you with a love that knows no boundaries. You might not always know what they want, but they always know what you need. They are to be treasured as they are treasures. Loyal until the very end. You bore the name Newfoundland. You would have been there. You seemed to love life all the more. Which fell from my face. At least God took you in your sleep. Like you have always done. I love you Bear and will miss you dearly. the world and wait now in the shadowy quiet of the past? security. They held a mirror wherein we might see ourselves as we long to be. command and protect with wisdom and justice, and imagination. kindmess and love - without thought of gainful return. some fairer place you run out again to greet us. a family all my own. that laugh and sometimes weep. to me,there is no other. he calls me his best friend. But, Oh, the names they give us, Lord! as I faced certain death. They're all the world to me. how lucky I am me. He is gone. Here am I. Where he'll find everlasting day. For he is on the Beautiful Trail. The deliver boy was his favorite prey. When you offered a home to Sarah that day. I have fits, I am clumsy and lots of things more. 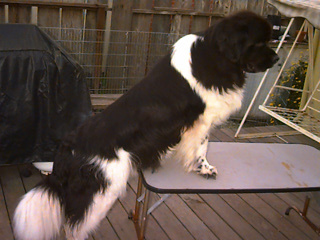 A Newf for your family - the dogs welcomed her too. Showed her pleasure at life with that typical grin. when mom bathed them - well, to a Newf's mind they might! Your life has now changed in ways you'd not guess. You'd just never have thought it would happen so soon. You knew it might happen, but not quite this bad. 'Please love me, don't leave me, I've a life I must live. You came into my life like a gift from above. giving me all your love in your hearts you can find'. Your heart breaks a bit more, there's no reason or rhyme. She came into your lives and your dreams all came true. 'Please love us, don't leave us, we need you' you cry. 'If it made you feel better we'd make pink pigs fly! As it is, you don't need that, thank heaven's above. If love helps to cure her, she's lucky indeed. We're all there for you, Sarah, to help you pull through. And Billee, please know that you're in our thoughts too. Liz Bradbury and the Scottish gang. and safety than I had ever known before. more toys and attention than I had ever dreamed existed. had only kindness and treats to offer me. is no way to measure the the "quality" of time. world can't heal a body that has been battered and broken for too long. the strength to let go and find my way to Rainbow Bridge. let them give you the strength to keep on lighting up sad, lost lives. my star will shine brighter with every life that's been touched by your love.